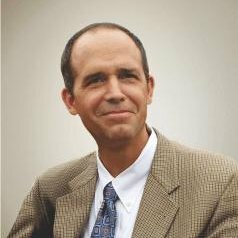 Here's a quick list of five different floor tile types and their associated benefits to help demonstrate the importance of proper component selection and pairing. One of the primary benefits of steel panels is that their electrical continuity makes them ideal for specific grounding standards and practices. Steel panel floor tiles also have excellent design load performance for supporting "dead-loads" as well as heavy rolling loads. 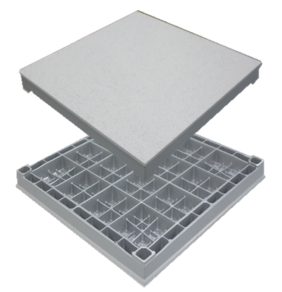 Steel floor tiles are surprisingly lightweight for ease of handling and for providing access to sub-floor components such as cable trays or other similar utility conduits. Finally, steel panels are non-combustible, which improves the overall fire safety of any work space. 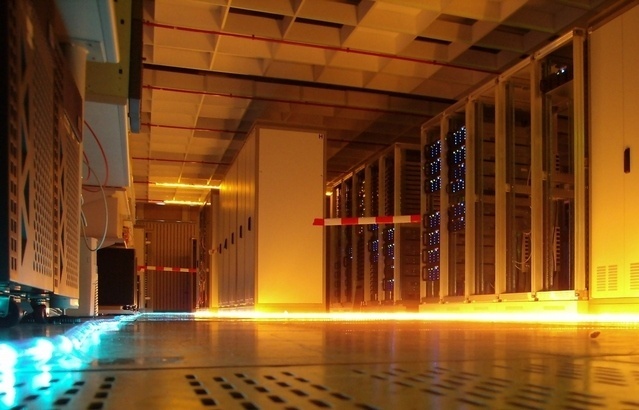 Perforated raised floor tiles are ideal for use in clean rooms, data centers, server rooms or any location which maintains specific air flow control standards. Perforated panels can withstand heavy loads and can be used in companion with steel panels in many applications. Specific laminar, or unidirectional, air flow requirements will typically dictate the location and quantity of perforated tiles that are employed in a space. 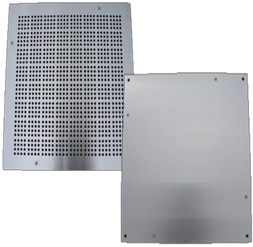 Raised floor grating panels are similar to perforated tiles, but these offer directional grates and/or damper controls for the purposes of channeling cool air to targeted locations, such as toward computer servers. For such an application, specialty grating panels by SB-Tech are designed for effective and efficient prevention of exothermic reactions caused by high-tech equipment. Their open ratios exceed 50% and they can be supplied in a variety of finishes from hammer-tone to Ni-Cr. By attaching an aluminum damper on the panel, the open ratio can be adjusted as needed during operation. Acrylic panels provide an alternative to metal tiles, particularly when weight reduction is a factor in the design. 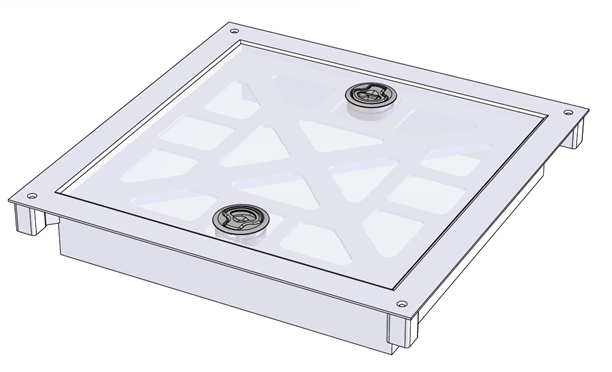 Transparent acrylic tiles work well as inserts for utility floor modules. 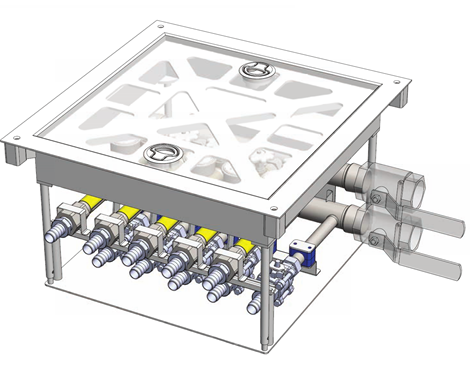 Floor modules drop into raised floor systems in place of floor tiles and can be used anywhere custom utility solutions are required. 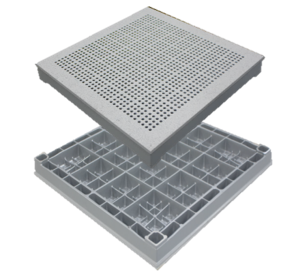 Transparent and non-conductive acrylic inserts are ideal for providing a safe walking surface and for serving as “view tiles” to monitor the critical utility systems, valve systems, conduits, hook-ups and gauges located beneath the floor or within floor modules. In addition to weight reduction and transparency, other benefits of acrylic floor tiles include their non-corrosive properties, easy handling, and ease of access to sub-floor utility systems. Solid panel raised floor tiles are designed for the stable operation of high load equipment. Solid panels can withstand higher loads than any of the other raised floor tiles. This panel is developed for high-tech and advanced manufacturing industries. 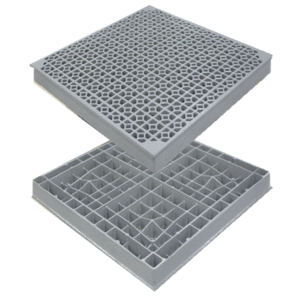 With grid-shaped high-density casting and an integral structure, solid panels maximize the dispersion of forces that are applied to their surface. This proves useful for both load bearing ability as well as vibration reduction from heavy machinery. Solid panels provide safe mobility for workers, perfect compatibility for existing equipment and they allow for a variety of possible surface finishes. NEHP, in partnership with SB-Tech, is proud to offer our unique ECO Al-Mg raised floor systems and floor tile options as the lightest, strongest, and most affordable floor product solution for virtually any work setting or application.